In this tutorial we will create a 728×90 animated banner GIF like the ones you see on blogs and webpages. I will use my own Logo “TutorialBoneYard.com” and just use simple text animation. Then we will save it as a GIF file which can then be played on a website. This tutorial is a Gimp version of the Photoshop X-ray Animation. It just shows you anything you can do in Photoshop, you can do in good old free Gimp. Create an animation in the Animation Playback window. Turn it into an animated GIF file. Watch a video of a cooler GIF animation with Gimp. You will use the same face and skull images for this project. You will use the Rescale tool, Iwarp, Blur, and Layer Masking. The Animation Playback window will preview the animation. Then I show how to make an animated GIF for a web page like the one I have on this page using just a few lines of HTML code. X-ray Animation in Photoshop. Create a Cool Animated GIF. Simulate a Cool App. 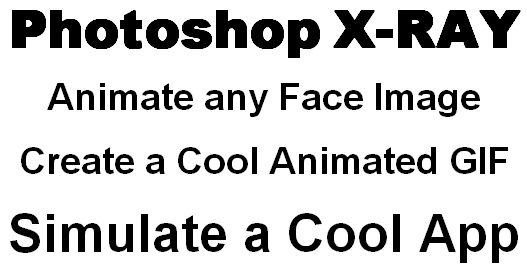 This is a cool tutorial. Take any picture of a human face. Download the skull picture. Then use Photoshop to create an animation of an X-ray scanner.